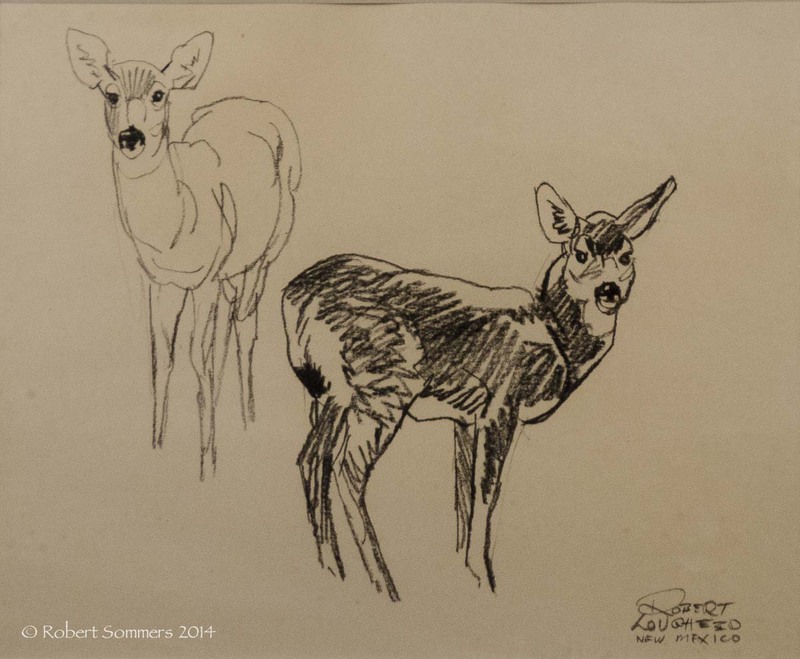 Robert Lougheed (1910-1982) Deer drawing on paper, charcoal pencil, nicely framed and matted 8 x 9″ sight p.o.r. Lougheed was born in Ontario, Canada in 1910. He received his art education at the Ontario College of Art and at Ecole des Beaux Arts in Montreal and was known to have studied under Frank DuMond and Dean Cornwell. The artist worked as an illustrator for the Toronto Star, National Geographic, and Reader’s Digest. He designed Mobil’s “flying red horse” logo and was commissioned by the US Post Office to design the six cent buffalo stamp for the Wildlife Conservation Series. He helped to form the National Academy of Western Art at the Phoenix Art Museum in Arizona. He also taught and mentored many of today’s finest wilderness artists. The artist was awarded the Western Heritage Award in 1966 and gold medals for painting by the National Cowboy Hall of Fame in 1969 and 1972. His work can presently be viewed at the Cowboy Hall of Fame. Robert Lougheed was an easel painter and always painted as well as taught his pupils to paint directly from nature. He died in Santa Fe, New Mexico in 1982.